If you live in the U.S. or another country with strong rules for keeping the air and water clean, it's likely your neighbors don't have radiation poisoning or barrels of pesticide festering in the backyard. Those in low- and middle-income countries are not so fortunate. They bear the brunt of almost all the cancers and other afflictions caused by pollution. Children are especially vulnerable. Fortunately, the Global Alliance for Health and Pollution is connecting needy nations with sources of help. "GAHP exists so countries don't have to deal with pollution on their own," according to Richard Fuller, president of Blacksmith Institute for a Pure Earth, a partner of the non-governmental organization. "There are terrific results where countries have done the right things," adds Stephan Robinson of Green Cross Switzerland, also of GAHP. The solution: Because children are at especially high risk, Pure Earth and Green Cross Switzerland placed water filters in schools and radiation shields in contaminated homes. Students became involved with the process, performing plays and making posters about radiation safety. Today, where filters have been maintained, water radiation levels have dropped by up to 65% and blood samples from school children have shown marked improvement. The problem: In the Agbogbloshie area within the teeming city of Accra, some people make their living by recycling electronic junk. Typically, recyclers burn off the plastic around cords and cables to get at the valuable wire, causing acrid smoke which sickens people and contaminates the soil and water. But putting an end to the practice was not an option. "Simply banning burning wouldn't help them earn an income," says Pure Earth's Kira Traore. 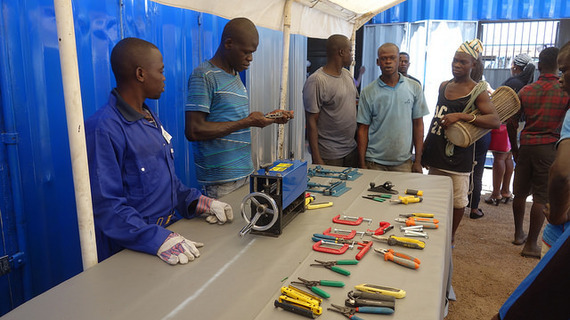 The solution: Working with the local scrap dealers association, Pure Earth and the Ghanaian government turned a blue shipping container into a makeshift recycling center and supplied hand-cranked wire-stripping machines. Now, recyclers who use the center are not only safer, they can sell the plastic they once destroyed. The problem: In this case, car battery recycling was killing children. It began when a lead smelter near the town of Thiaroye-Sur-Mer offered $100 per day to anyone who collected lead from dead batteries. Women, working at home with their children nearby, began cracking open batteries by hand and purifying the lead on open fires. Soon, the children began to die from acute lead poisoning. Blood lead levels of those still alive were "astronomically high." The solution: In cooperation with the local community, Pure Earth and the Senegalese government removed lead from around the former recyclers' homes and deep-cleaned inside to remove toxic lead dust. Next, they trained the women to grow food using water-conserving hydroponic agriculture. Today, blood lead levels among children have dropped significantly, the women have a new source of income, and villagers have better access to peanuts, onions, tomatoes, greens and other fresh, nutritious food. "The women of Thiaroye-Sur-Mer are absolutely committed to change for the health of their families," reports Traore. The problem: The way artisans hand-craft painted pottery comes at a deadly price. Most pottery is fired with a glaze containing lead (which is technically illegal). Lead from the glaze then leaches into food. Twenty of the 32 states in Mexico produce pottery, which is used by tens of millions of Mexican people. Currently, half of the nation's children have blood lead levels high enough to lower intelligence and affect behavior. The solution: In the state of Hidalgo, the Mexican government teamed up with Pure Earth to introduce potters to a boron-based glaze which contains no lead, does not affect quality, and costs less. In villages using the new process and where lead has also been removed from equipment and soil, blood lead levels in children have plunged. Pure Earth is now calling on the Mexican government to enforce its ban on lead glaze and encouraging buyers, shops and restaurants to request the lead-free alternative. As in Mexico, all of these approaches can be scaled up, given enough cooperation and support. Fixes can be relatively inexpensive. Sometimes, only advice is needed, or training to run equipment that is commonplace in more fortunate countries. Pollution does not respect borders. People in Los Angeles breathe air contaminated by Asian smokestacks. Anyone has a chance of eating fish tainted with mercury. It doesn't make sense to turn a blind eye on those needing help in their corner of our collective earthly nest. As Nathalie Gysi of Green Cross Switzerland says, "We have something to give they desperately need." Which leads to the question: is it possible for nations to be mindful? Find out more about helping protect people from pollution and how to start your own campaign to raise awareness and funds here, or by watching this video. Photos courtesy Pure Earth. This post first appeared on DurableHuman.com.